Most companies that are successful with content marketing typically employ a skilled team of strategists, editors, writers, and designers. You can achieve a lot with a small team but as it grows you may benefit by making a developer your next hire. For more complex projects, you need someone with technical knowledge, which often has meant leaning on your IT department. However, content production becomes far more streamlined when you have a developer on hand at all times. A good developer is passionate about testing and understands conversion rate optimization, which is essential if you’re serious about creating content that not only engages but also improves the company’s profits. Also, developers usually have a great grasp of analytics, so they’re good people to help determine whether your content is working and which facets could be modified to get better results. The analytical mindset of a developer is a great asset when combined with the creative outlook of most designers and writers. With a team of diverse skills and perspectives, you can ensure that every aspect of your content works, including informational value, visuals, and functionality. While web developers are renowned for being introverted technicians, they must be good team players, too. 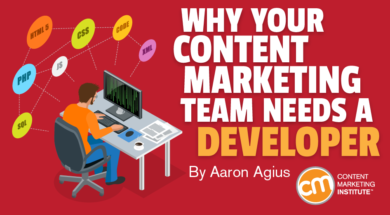 For your content team to function as a well-oiled machine, here are some qualities you should look for in a new developer. People with an analytical outlook are normally quiet, intensely curious, and fanatical about pattern recognition. These individuals despise logical contradictions and are natural problem-solvers. Good developers can work for hours in solitude and they normally have fantastic memories – at least for information relevant to them. Developers who are technical wizards but lack communication skills will hinder your projects. In my experience, people with analytical outlooks don’t always possess the most outgoing and effervescent personalities, but good developers can break down problems and present solutions in a coherent way for their non-technical teammates. While your designer team members may relate to a developer to some degree, a content marketer lives in a different world. This needs to be factored into their communication. Arrogance and coding are not a good partnership, particularly when your company’s digital presence is at stake. With an arrogant mindset, developers may think they know best when they really don’t, which can have disastrous consequences. All developers experience situations where they don’t know the correct course of action. Having humility means they can admit their shortcomings and search for new answers for the greater good of the project. A willingness to listen to constructive criticism and try new approaches also is essential. Good developers follow standard protocols – crafting code that is readable and properly structured. Given that web development is evolving, good developers also learn habitually about new technologies and advancements. Fortunately, most developers are naturally curious and are on the lookout for effective new solutions to problems. These tests can be a great place to start before you move to bespoke tests, such as creating a secure page that allows customers to update user information in a database while preventing corruption risks. Though you shouldn’t take offense if developers prefer to code rather than make small talk, they should communicate regularly with their teammates to stay on track with projects. They must want to be part of a team and take pride in collaboratively moving toward a shared goal. TIP: Introverted workers can become overstimulated by intense environments. Forcing the person to work in a bustling open-plan office is unwise. A developer needs solitude to solve problems. Provide a quiet working space where they won’t be disturbed but within walking distance of their colleagues so they can interact when they choose to. Or consider remote-work arrangements. The difference between a good developer and a great one is that the latter doesn’t just want to find an efficient solution to problems, a great developer wants to find the solution that delivers the most value to the end user. While web development is typically considered a narrow and insular field, developers become extremely valuable to teams when they’re able to understand a customer’s desires and pain points and reverse-engineer solutions accordingly. In other words, having genuine empathy for the end user can turn a good developer into a rock star. A positive attitude is essential for all team members. It’s especially important that your developer is easy to work with – because that person often is the final call in the content production process. A developer that has a sour attitude can ruin the atmosphere of the team because that’s the person involved in uploading content and ensuring that it’s functional. Look for a developer who loves the vocation and is passionate about working toward a shared goal. Lots of great developers resist working in traditional office environments, so I’m fine with hiring remotely. I use Upwork to find developers for short-term projects and Outsourcely to build long-term working relationships. To find the best developer matches for your project, specificity is key. That’s a lot more specific than stating you need a developer to improve purchasing capabilities for your e-commerce store. If you don’t know what technologies are required for your project, do some research before you write the developer description for the project. Finally, pay developers what they deserve – not what you think you can get away with. I’m a firm believer in the adage, “If you pay peanuts, you get monkeys.” While the short-term incentive to hire someone for $5 per hour is understandable, you’ll end up spending more money in the long term when you have to hire a new developer to fix their sub-par work. You don’t need to hire a native speaker for great results. I’ve worked on English-language projects with some excellent affordable developers from developing European countries like Romania and Ukraine. However, I specify in my project job description that high English competency is essential. Do you have any tips for integrating a developer into a content team? Please let me know in the comments. Make sure all members of your content marketing team are learning about advances and changes in the industry. Encourage them to subscribe to the free CMI daily or weekly digest newsletter.